Use to seal around branches and main trunks at roof level or through walls. This material is very flexible and allows the tree to move while still keeping rain from getting into the treehouse through gaps around roof and wall coverings. 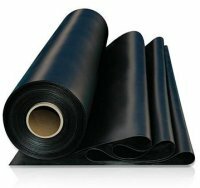 Used in a similar way to Neoprene (above), EPDM is a heavier, less stretchy material, but it is more resistant to UV damage and abrasion. This is a 10'x10' sheet suitable for cutting multiple strips to seal around branches and main trunks at roof level or through walls. This material allows the tree to move while still keeping rain from getting into the treehouse through gaps around roof and wall coverings. 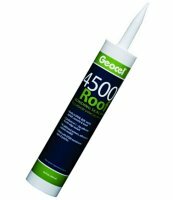 This waterproofing caulk will stick strongly to a wide range of materials and provides excellent waterproofing and flexibility. Use around trunk/branch seals and to cover nail holes in felt roofing or flashing. This sealant is waterproof in around 2 hours. General purpose thin rope for lifting tools and lashing materials in position. Not suitable for climbing use. Burn cut ends to seal them and prevent fraying. 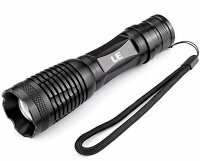 Excellent value, very bright LED flashlight. Fits in one hand and runs from a rechargeable 18650 battery, or 3 x AAA batteries. Ideal hammock for sleeping out in the trees. Built-in insect mesh protects you from bites during the night and is more comfortable than a hard floor. For treehouse supports you will be using a selection of heavier lag bolts and standard bolts that are weather resistant (galvanized or stainless steel). The house framing can be assembled with nails but screws are recommended, because of their ease of installation with a portable drill, their accuracy and resistance to loosening. Between all the bolts and screws required for a typical treehouse, it is easy to spend as much on hardware as on the wood, so calculate what you need in advance and buy in bulk wherever possible. 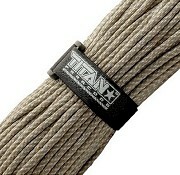 Rope with low elasticity, used for rappelling (abseiling), lifting loads and when working while suspended. Can be substituted with cheaper polypropylene rope but braided climbing ropes are softer to handle and will accept knots more easily. 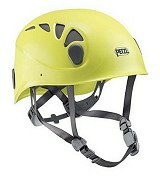 General climbing safety rope. The rope can stretch to absorb some of the impact of a fall so is much safer than static rope. For situations where you will be working while suspended, a static rope should be used instead. Head protection from falls and impact with materials during treehouse construction. 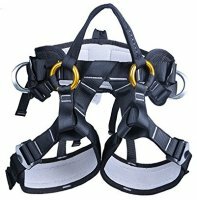 Wide waist and leg supports to allow sitting, with plenty of places to clip in climbing gear and tools. 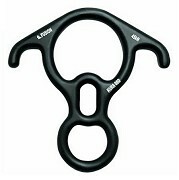 Screwgate carabiners are recommended for all treehouse climbing, to avoid accidental opening. They should always be used when lifting materials. Double wheels for stability and smooth running on steel cables. Can also be used on horizontal static rope to make a movable crane point for lifting heavy items into the tree. Simple but effective small pulley that can handle heavy loads. Attach to a strap in the tree with a carabiner as a lifting point. With a second pulley attached to the load you can lift with half the effort. 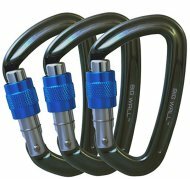 Mainly designed for rappelling (abseiling) down a rope, which is the fastest way down from a high treehouse, but can also be used to belay a climber from the ground or anchor a lifting rope to the ground to prevent it slipping back over the pulley.